OK, I admit it. I’m a hypocrite. No, really. No need to protest. It’s good for me to come clean about my own hypocrisy. I know exactly what I need to do to improve my health and lose weight and get in better shape (although I do insist that we all admit that “round” is a shape!”), and I have even unleashed my hypocrisy on others by “advising” them how to exercise, lose weight, and be healthy. It seems my hypocrisy knows no bounds (hat tip to Wyatt Earp and Doc Holliday). In our Gospel Lesson today, Jesus takes our easy hypocrisy head on. In fact, He takes no prisoners in His clear, unambiguous, and straight forward comments. He leaves us no where to go except denial or repentance. Love them or hate them, these words simply don’t offer us many options. So Christ tells us that someone who follows His words, obeys His commands, and lives the life He calls us to live is like a man who builds a house on a solid foundation. When the storms come, and they most surely will come, the house stands strong. But, if I don’t obey the Lord’s commands, if I disregard His teachings and His wisdom, then I am like a man who builds his house on a weak foundation. When the storms come, and they always do, my house won’t stand. It will fall down. Not many places to hide here, dear ones. Sorry about that. The truth is I have proven these words true over and over again in my own life. At times my “house” has weathered the storm. Other times it has crashed to the ground. And each event in my life, whether success or stumble, I have been lovingly led to see myself as I am and how I need to grow and repent. So, successes and stumbles are valuable and the Lord doesn’t waste any of it to make me like Himself. But for me to follow Christ, I have to come to know Him and trust Him and make myself purposefully a follower of Him. 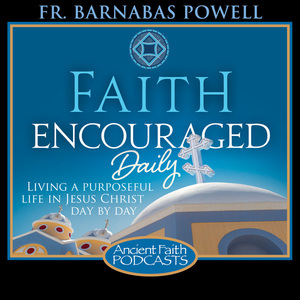 I have to exert the effort to be in a consistent relationship with Him, which means, especially for we Orthodox Christians, a direct, visible, tangible, and consistent relationship with His Body, the Church. I can’t have a relationship merely with the “Head” of the body and ignore the rest of Christ! “Me and Jesus got our own thing going” simply isn’t allowed by either the scriptures or my own need for accountability and wisdom from my brothers and sisters in Christ. If I am going to beat back the monster of hypocrisy in my own heart, I have to start by coming clean about how easy it is to be a hypocrite, and then purposefully embrace and practice the wisdom I already know AND delve deeper into this faith so that my foundation on Christ will be as strong as possible. Today, you will be confronted with the temptation to hypocrisy in small ways and maybe even in big ways. The path to avoid the fate of a weak foundation for your life starts by admitting that truth. Then, stay awake to the little hypocrisies you stumble over through the day and quickly say “Lord, have mercy” when you stumble. Get back up and keep following this pattern till you no longer stumble! If you call Him “Lord” then, today, live as if that were really true. Just want to say that your voice, your view that you bring to help me understand, is so refreshing. 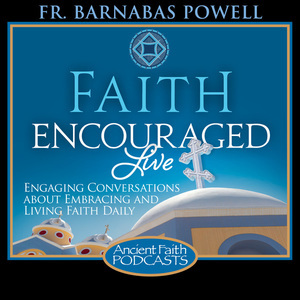 I have been stuck on your talk about waivering faith on Ancient Faith radio. I’ve listened to that on the way to work three times. Thank you, thank you. You gotta get your own show, Father! You have a way to make us converts listen and say, “Man, that is good stuff”. 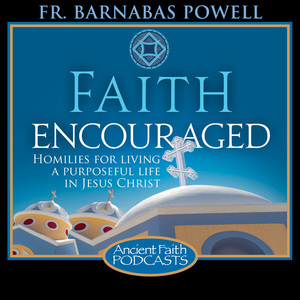 Thanks Barnabas. Please keep us in your holy prayers that we will remain faithful to the calling of God on our life.